Update: I'm no longer selling Debian CDs; this page remains here for reference only. The current release of Debian GNU/Linux -- version 3.0, code-named "woody" -- was released in July. To help users who don't have the time or a fast enough Internet connection to download the distribution themselves, I am offering to burn and sell CD-Rs containing version 3.0r0 which, at the time of writing, is the current release version. The price: £2 per disk, plus £2 per order for postage and packing. 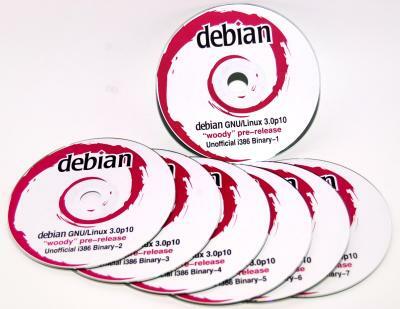 These CD-Rs, made from Official Debian images, are suitable for either installing a fresh system with Debian or upgrading a machine currently running a prior release of Debian; just boot from CD to install Debian from scratch, or, to upgrade, use apt-cdrom to add each disk to your /etc/apt/sources.list. The installation manual for Debian GNU/Linux 3.0 has more information. Here's what I currently offer. If there are CDs you'd like but which I don't have yet, let me know. The complete binary distribution for each architecture consists of 6 or 7 CDs. In most cases, however, not all are needed. The first CD contains all the packages needed for a basic install with most of the basic tools and the packages needed for the standard task selections. The second CD contains the GNOME and KDE desktop environments. Since there are so many architectures available, details of each, including disk reference numbers, have been moved to their own pages. If you don't know the architecture of your PC, it is almost certainly i386. All the other architectures are comparatively very rare. Official alpha binary disks 1 to 7. Official arm binary disks 1 to 6. Official hppa binary disks 1 to 6. Official ia64 binary disks 1 to 7. Official m68k binary disks 1 to 6. Official mips binary disks 1 to 6. Official mipsel binary disks 1 to 6. Official powerpc binary disks 1 to 7. Official s390 binary disks 1 to 6. Official sparc binary disks 1 to 6. Official source disks 1 to 7. At present I can accept these kinds of payment. I'll send out details on receiving an order. Cheques and Postal Orders made out in pounds sterling which can be deposited into a UK bank account, sent through the post. Several banks now offer the facility to make a direct transfer between accounts via the bank's web site. You may find this more convenient than writing and posting a cheque. Bank transfers usually take longer than it takes to send a cheque through the post. If you'd like to make a donation to the Debian Project, you can add the amount of your donation to your order and I'll pass it along for you. At present, I only send disks to UK addresses. Disks are sent out in a card-backed envelope marked "Optical Media -- Please Do Not Bend". I'm afraid I can't take responsibility if your postman folds the CDs in half to get them through your letterbox (postmen do strange things). Ensure you can take delivery of the disks by post within the UK. Decide which disks you want, and make a note of their reference numbers (given above). Total up the price of your disks: £2 per disk plus £2 per order for postage and packing. Decide how you'd prefer to pay: cheque or bank transfer. Send me an email with the reference numbers of your selection of disks, your chosen payment method, and the address you want them delivered to. and the amount of any donation you want to make to the Debian project, I'll reply with an order reference number and details for completing the payment, and will keep you up-to-date on the status of your order thereafter. I aim to send out all orders within two working days of cleared payment. As with any CD-R media, treat the disks properly if you want them to last. CD-R recording is done by briefly heating a dye with a laser and relying on a change in its molecular structure when it cools. Therefore, do not store the disks where they could be subject to sunlight or direct heat. The risk of scratching the unprotected recording layer of unbranded CD-Rs is much reduced by the full-face label I apply to each CD. Because these disks are CD-Rs, they cannot be absolutely guaranteed to be compatible with your CD-ROM drive. At present, I use unbranded 74- and 80-minute CD-R blanks which cdrdao claims are made by Prodisc Technology Inc. I record them at 16-speed in DAO mode (Disk At Once). (Ask if you want yours recorded slower; there is a small extra charge for this.) According to cdrdao, they are "Short Strategy Type, e.g. Phthalocyanine" disks. They should work fine in any modern CD-ROM drive and practically any CD writer or DVD drive. If you'd like any more information, feel free to contact me.